The Curse of Brimstone #1 Review – AiPT! A good introduction to a middle American character. 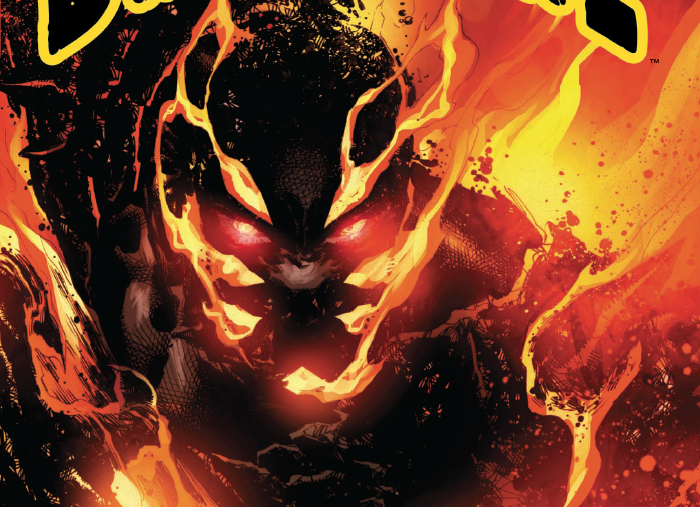 DC Comics’ “New Age of Heroes” continue to roll out and this week we get Brimstone. Following up on Silencer and Damage, Brimstone is the third of DC’s new heroes and helmed by Philip Tan and Justin Jordan. Judging by the cover he’s got some kind of fire powers, but what lies beneath those powers? Joe Chamberlain would do anything to save his small, forgotten town–even make a deal with the devil. But things get worse, and Joe finds himself cursed with the power of BRIMSTONE. With the power of fire and destruction coursing through his hands, Joe must now track down and destroy the demon he made his deal with before the power he now wields destroys the town he was trying to save. But as the fiery pain inside him grows, can this young man overcome his own demons before his power rips him apart from the inside out? Considering how much DC is putting into these new characters one has to imagine they’ll be mixing it up with top-tier heroes like Superman and Batman soon enough. The fact is, it’s quite exciting to see one of the Big Two push new heroes so hard. Judging by this comic they’re not holding back when it comes to character development which is a good sign they’re here to stay. ::Record Scratch:: you’re probably wondering how I got into this mess. This issue devotes 13 of its 21 pages to developing Joe Chamberlain and his deadbeat town. That’s a lot of pages focused on showing us the deeper meaning of a character and where they live. It’s a town that has been reduced to poverty due to coal mines leaving the people with nary a job. Joe is a young kid who wants to leave his crappy town and certainly has ambitions, but Tan and Jordan do a good job explaining how that’s just not an option some people have in small-town America. Through Joe’s interactions with a local officer, hearing about his father’s disability, or just reading his narration as he explains you need a car to get anywhere in this world, you get a strong sense of this soon to be hero’s perspective. It’s refreshing, especially in the DCU, because this character is very realistic and has expectations, not unlike many Americans. It’s not all about small-town America and Joe’s plight as the other 8 or so pages reveal there’s a supernatural element to the book. I can’t say there’s enough to really understand what is going on, but it’s clear the creators are following some sort of deal with the devil plot. That jives well with the unexpecting boy who wants to be free of the town but doesn’t know the cost. Tan draws in a gritty style that suits the supernatural angle and the rundown nature of the town Joe lives in. Later in the issue, you get a taste of Brimstone’s powers which are conveyed in a beautifully chaotic way. A lot of Americans will relate to this story. There isn’t much heroics going on here with a hefty dose of character work. When there are supernatural elements the art doesn’t do you any favors in explaining what is happening because it’s so chaotic. That leaves you scratching your head and guessing at what is going on. Maybe that’s the point, but with so much set up it’d be stronger if we knew where this was going. As it stands it seems like Joe was chosen completely at random though I imagine that’ll be proven wrong later. As it stands this character seems to be some kind of Ghost Rider like hero, but you’ll be intrigued by all the character work to keep reading. I’m intrigued, but so far it’s unclear what this character’s superpowers are all about and instead, this issue leaves readers with well-written town and character. That should be enough to keep readers coming back, but the tease of the powers and who gives them to Joe leave you wanting more. A good intro issue with a healthy dose of backstory, but you may be expecting more from the hero angle.